Up until very recently I was under the assumption that a dishwasher was a dishwasher. I knew that some looked a bit fancier than the others and some had a few more “bells and whistles”, but they all washed the dishes… the. end. Then… LG Electronics asked me to try their integrated TrueSteam dishwasher. Not only does it have a TrueSteam generator, but it has a feature I have never seen anywhere… a flexible EasyRack Plus system. I was intrigued enough to say yes. With a family of six, we go through a good amount of dishes. Sometimes loading the dishwasher feels like a game of Tetris, turning the dishes in every way possible to get the best fit and use of the space. At the end of our stacking game there are always a few odd ball items that just don’t make the cut and end up in the hand wash pile. This beautiful dishwasher offered me a way to fix this problem. I mentioned above that LG’s TrueSteam Dishwasher features an Easy-Rack™ Plus system with a height adjustable third rack. The tines (the metal dividers that help divide the dish rack) have always been my biggest frustration when loading a dishwasher. Some evenings I would love to load my pots and pans in with the dishes, but they usually end up in the hand wash pile because we just can’t make everything fit into the same load. The LG TrueSteam Dishwasher makes loading all your dishes easy (watch a video about it here). The tines are adjustable (meaning you can lay them flat or keep them upright)! Not only can you adjust the tines, but the third rack is adjustable up and down making more room where needed for larger items like pots and platters. The very top row is great for smaller cups, serving utensils, sippy cup lids, or nicer silver that you would rather not knock into each other… all the small things that would not have a “place to be” in a typical dishwasher. At last, you can fit it all in! The LG TrueSteam Dishwasher offers a unique cleaning cycle that virtually eliminates the need to pre-wash your dishes using steam. Even if your dishwasher doesn’t run every day and your dishes sit and dry out, the steam power rids your dishes and silverware of caked-on stains, crusted on food gunk and more – without adding more noise to the cycle. Watch a video about the TrueSteam cycle here. Speaking of noise, you can barely hear this dishwasher running! My husband almost opened it yesterday while it was running because he didn’t hear it on! The Direct Drive™ Motor reduces noise and also improves overall energy efficiency. Its dual-steam spray options allow users to customize the water pressure for each rack, and the dishwashers are 20 percent more efficient than the rigorous ENERGY STAR® standards. So after all of that…. what are my overall thoughts? I will admit it took us about a week to get the tines set for a standard load for our family. Once we figuring out the best loading style for us, loading the dishwasher is a breeze and very space efficient. We used to run our old dishwasher on a daily basis. 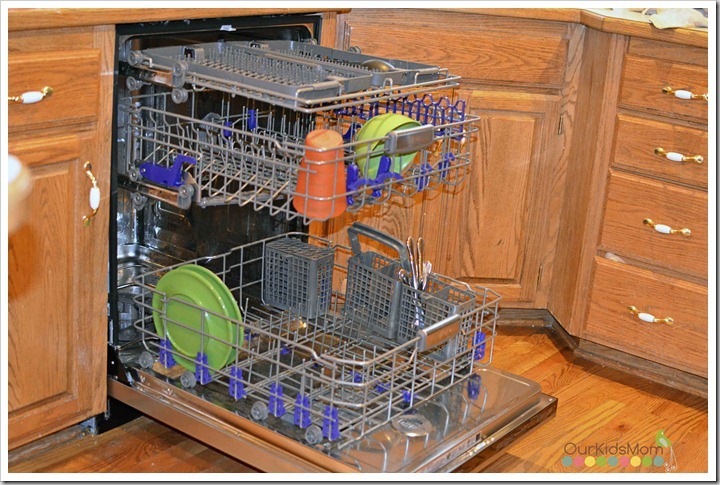 With the LG TrueSteam dishwasher, we are able to load more dishes and now run a load about every day and a half now. Not only are we saving water and energy this way, but because it’s Energy Star qualified it already saves nearly 5,000 gallons of water a year versus hand washing! Having such a wide variety of wash cycles including steam helps ensure I have a clean load… every wash. Between the sleek looks, the quiet cycles, the hidden control panel, the child lock and the ability to run a sanitary cycle I am beyond sold on the LG TrueSteam dishwasher. 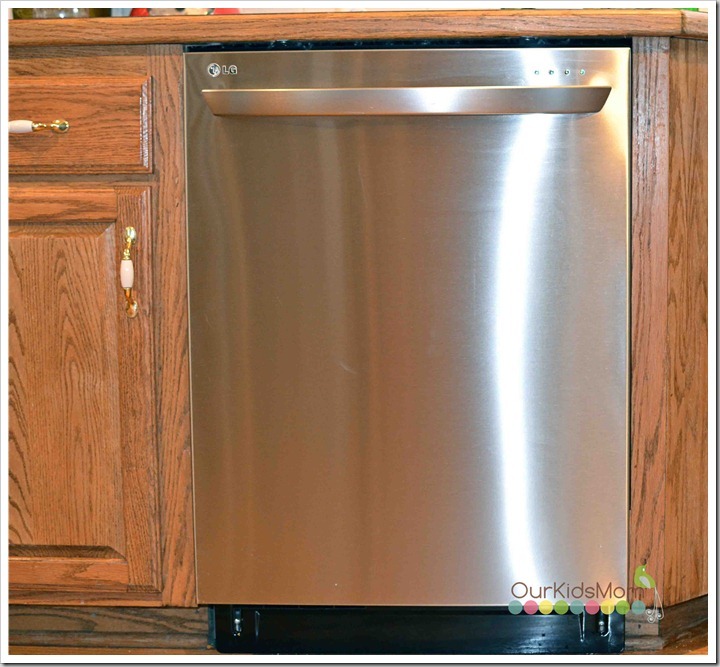 This video gives a great inside view to the LG TrueSteam dishwasher…. Disclosure of Material Connection: LG provided their TrueSteam dishwasher for review purposes only. They will also be providing a trip to NYC, all expenses paid by LG Electronics, to compete in a Loading Challenge and Wine & Food Tweet Up. All opinions remain 100% my own. I only recommend products or services I use personally and believe will be good for my readers. I am disclosing this in accordance with the Federal Trade Commission’s 16 CFR, Part 255: “Guides Concerning the Use of Endorsements and Testimonials in Advertising.” Your experience with the product may differ from mine. The sponsor is responsible for prize fulfillment and will be shipping the winner(s) their prize(s). For more information read my disclosure policy. Thanks for sharing this article, i also searching to replace old dishwasher to new one.. I think LG dishwasher is perfect..
My loading style name would be ” Here, There, and Everywhere” and I would describe it as completely disorganized, haphazard, and random! My loading style? CHAOTIC. This is a cool dishwasher. I pretty much hate the one I have now. I would love to win the trip to NYC- thanks for the chance! My dishwashing style is “JENELLLLLLE… time to do the dishes!” – my 10 year old does the dishes because we don’t have a dishwasher! When we had a dishwasher, I would do two smaller loads a day instead of one big load so it didn’t seem like as much work. I like to load things in order, so I stack all of the dishes first. Our old dishwasher was, well, OLD… so it only worked half the time. I love the photos of this dishwasher, it looks AMAZING! According to the official rules, this contest ended on the 15th of September. Your info says through the 24th??? Yes it is the 24th for my portion of the contest. I have emailed LG to see if they can amend the official rules to state the correct dates. My loading style is the “Shift & Snuggle”. My four year old son loves to help me load the dishwasher, so when he puts plates in, I tend to hug him and tell him how proud I am of him as I shift around the dishes into their correct places. It’s a great chance for us to bond and for me to teach him the skills he’s going to need someday, as well as a good start for teaching him about responsibility. I need a new dishwasher and this one looks quite amazing! I have three kids, and I feel like I’m loading and unloading the dishwasher at least once per day, sometimes more. The noise on our dishwasher is a loud rumble and screech- I love that you couldn’t even hear anything while running this one. Beautiful! I would describe my style as organized. I load dishes by size and shape. Rearranger. How mant times can I rearrange? Start by sorting through the family attempt to put things in washer (really does a bowl need to be on the top rack and not with the other bowls in the bowl area) then load the dinner things and try to fit odd pieces in here and there.. Until the most items are loaded. My loading style would be called “If it fits it washes, most of the time.” I start at the bottom loading in plates, utensils, pans, and blender/juicer items. Then I move on to the top where I line the sides with glasses and spatulas. The center is a hodge podge of bowls, bottles, pump pieces, and other baby paraphanelia. I’ll stand back and then try to stuff other things in all the nooks and crannies. Once started I know this dance will begin again in a few hours; I don’t hand wash my dishes. My loading style would be called, “Slam & Cram!” I throw those suckers in there as fast as I can and try to squeeze in as many dishes as I can! I have a set system I have figured out for where each type of dishes fit best in my dishwasher. I line up all the like types of dishes in the same spot every single time. For example, all the adult cups go on the top shelf far right right, followed by kid cups, kid bowls, spatulas and then the random miscellaneous dishes that don’t quite fit anywhere else take up the last row. Stuff N’ go. Stuff everything in as fast as possible and hope for the best. I call my style “PICTURE PERFECT”. Which means I, pretty much, go by the book. I’m one of those people who, not only reads the owner’s manual, but actually follows it. A place for everything and everything in it’s place! That’s why I would be so in love with the LG TRUE STEAM DISHWASHER. With all the adjustable racks and spindles there would always be a place for everything and everything would always be in it’s place! I completely trust the reviewby OUR KIDS MOM and would love to own anything she approves of. New York would be icing on the dishwasher cake!! My style is the wash, drop and load. First my dishwasher is old so I have to prewash, then I drop oops broke a dish! oh well less to clean next time, load almost full oops dropped another dish. Hubby I think you did that on purpose. No why would I do that? Less mess next time oh yeah. Finally loaded. 2 hours later dishes done, half melted oh now forgot to turn off the drier. Darn less dishes next time. Repeat the next day. My loading style is “Put them in the sink and run the hot water” – I don’t have a dishwasher. What I do have is a teen son who is fond of leaving dishes in his room until the weekend. At that point, there’s a game I play called “What WAS that on this plate?” This dishwasher would be just the right thing to get the “mystery food” off of his plates without having to soak and scrub…and soak and scrub some more. Thanks for a chance to make my life easier! Of course you may wonder what the description of my geniosity is….well, my kids load the dishwasher with their dirty dishes. And then when I open it to see all of the dismay they have caused and total lack of ability to place things in an organized manner, I give into their story EVERY time that they just can’t arrange things as well as I can. Therefore, making me (mom) a freakin genius! loading style would be called “throw in and close the door quick!” – does that not describe what I am doing?! (maybe i should have used less words?) I pull out the drawers and shove in what I can, then just close the door quickly before any of it falls out of place. Then wash and hope that it all gets clean. My dishwasher loading style is a “puzzler”, description a Puzzler puts as much stuff into the dishwasher as humanely possible so they only have to run as few times as possible this can be accomplished by loading and reararranging as many as 20 times to make sure all space is utilized! My loading style, I just rinse and throw it in, works for me! This dishwasher is beautiful, I think I would “place” my dirty dishes in this one! Also LOVE, NY and what a hoot that would be. Also love wine, travel and adventures, so this would fit the bill!!!! My style Is ” stuff It”, wIth a famIly of 6 & cookIng 3+ meals a day, we always have dIshes!! The name of my style would be “Im not good at this”. And the description would be “My husband does it”! Everything in the bottom is aligned by size, with the exception of the middle 1/3 behind the silverware rack. I find that spot fits my toddler’s smaller character plates just perfectly! I like the silverware to be organized by knives (upside down), forks, spoons, & “extras”. I just find that it saves SOOOO much time when I am unloading it. I try to make as little work for myself as possible. Although, somehow, it always seems like there is more than enough 😉 My hubby does not scrub the dishes before putting them in the dishwasher & puts things in very haphazardly (when he puts them in at all) and I am always secretly pulling them back out to scrub them or rearrange the dishes so that I can fit more dishes in. C’mon, does ONE big large bowl need to take up an entire quarter of the top rack? Sometimes he will catch me & rearranging & be all “Hey, what are you doing?” And I innocently say “Oh nothing!” I don’t want to make him feel bad, so I don’t harp on him, I just do it. Much like many other of our (my?) household chores. LOL. Can’t complain too much though…. he tries. This is what you get when you marry a man who had nannies & housekeepers all of his life. I prefer to blame my Mother-In-Law! Hah! Sadly I am the worst at packing the dishwasher. My husbands says I need to go to dishwasher packing school. My loading style would be entitled Enginerring ingenuity. It is the ability to creatively and scientifically place almost all the dishes for a family of four in your dishwasher and they actually end up clean. Cause that is science!!!! I am a little OCD and load the dishes the same way every time. Glasses on tops, plates and bowels on the bottom. Loading style: Get out of Mommy’s way, she’s loading the dishwasher! Description: I’m an organizing queen and that includes loading the dishwasher. When I’m loading the dishes from the sink to the dishwasher everyone knows to move out of Mommy’s way. I like the dishes organized, and fast! Very cool. Have been looking for a dishwasher. My loading style is called quick and does it bite? 3. Help the environment wash as few loads as possible, so stuff as many dishes in as possible. “Multitasking Mama!” Being a mother of 4 I have to make life work for me not the other way around. So I put more than dishes in the dishwasher. I wash my 9 year olds baseball hats, my 7 year olds shin guards, my 5 year olds sticky craft scissors and my 3 year old toys. It all fits, it all get clean and the world (well my world) is a happy place. My loading style is : If it fits-it washes. Hahaha. First I put the silverware in its respective place in the basket. Then it all breaks loose from there on out. I try and put the plates lining along the front-sides of the dishwasher, the glasses on top, but then I start running into problems once those places are full. I’ll lay spoons on the rack that are too tall for the silverware basket. Other, smaller dishes get put on top of the glasses-I hate to waste a wash! I understand cramming all that in there reduces the effectiveness of the wash cycle, but I would rather not hand wash items or save up items for a second wash.
my loading style would be called “Neat and Tidy aka OCD”. I organize it very well, with nothing overlapping anything else. cups and bowls go on top, dishes or pans go on bottom. It drives me insane when things are just piled into a dishwasher with no organization!! My loading style would be described as “Left is best!” I put everything in from the left to the right (i’m left handed) Dishes first, then cups, then silver ware… My husband hates my dish loading style! A trip to New York? Tickets to the Food and Wine Festival? And possibly…a love story (I’ll explain if I win). Why, that sounds like a fairytale come true! I like to load my dishwasher Cinderella-style. You see, I start by opening my kitchen window to summon my little helpers with song. “Ahhh-ahhhh, ahhh-ahhhh,” and then, just as you might imagine, nearby birds, mice, squirrels, and other helpful critters join me for a dishwasher loading session. I sing, “Whistle While You Work,” and wouldn’t you know it, they sure do. The woodland creatures demonstrate their astonishing mechanical dexterity by using their tails, feathers, and other attributes to help get the job done. After we’ve rinsed all the dishes, the birds load the top rack, of course, while the nut-lovers and bunnies properly organize the bottom rack. The mice usually just hum along to the happy working song until it’s time to add the soap, and then they form a little assembly line to deliver the detergent pouch into its receptacle. It’s really quite impressive. You wouldn’t believe how excited the raccoons get to push the start button. When we’re all done, we like to celebrate by twirling around a few times. The LG TrueSteam Dishwasher looks amazing. I’ll need a fairy godmother’s help to get it! My style would be called CramJamSuperslam, SwitchChange& Rearrange, Shout&Swear&CountToTen,TakeThemOutAndWashByHand! My style 1123 in you go and my description use both hands add a little speed and the 123 count and your all done. Dawn @ With a Side of Thriftiness! Yes, I load that dishwasher not just once…I am a two timer. Manic Reloader- It has to be ran whenever it is at least half full and all the dishes have to be put away as soon as they are all clean. I load constantly as I go. It can never just be sitting doing nothing. It has to be at work. No clean dishes can take up residence..
Loving it light! I worry that if I stuff it too much it will not wash well. This way it cleans it all! My husband does the dishes while I cook. I would describe his loading style as “All Fall Down” because I will open the dishwasher to find lids, silverware, straws (pretty much anything tiny) that have fallen through the racks in the bottom of the dishwasher. I’m not sure how he does it, but there is usually two items that fall down each washing cycle! “There’s a Method To My Madness” is my loading style. Cups and glasses on top, plates and large bowls on the bottom and silverware in the cuttlery tray on the bottom rack. Because we have a large family and use a lot of pots and pans, we have to run 2 loads in the dishwasher because all of the pots and pans won’t fit. My dishwasher loading style will be called “The Loader with Obsessive Compulsive Disorder”. First of all, I wash all the dishes down before I even load them in the dishwasher with hot water and soap. Then as I load them the cups are on the top rack in order of small to largest. On the other side of top rack I put the glasses in the same order. In between the cups and glasses I lay the large cooking utensils and knives in the middle portion of rack. For the bottom rack, plates are loaded from smaller to larger on left side, and bowls on right side in same order. I place the utensils with the spoons in one part of utensil holder, along with butter knives in another, and of course forks in another. Its crazy I know. To top it off I run the dishwasher with a pre-rinse hot cycle, to make sure ALL the germs are washed away, and put the hot air dry cycle on so there are no rinse spots! Anyways, It sounds crazy but its just how I run my household. I need organization to feel at ease with my surroundings…. I would call my loading style light and airy I don’t overload it I like the dishes to be able to breathe I do a load every couple of days. Loading Style: Get in Get out My load style is functional. I load all the plates, cups, silverware properly or at least in my mind its proper. There are all lined up. Then what happens is all the odd pieces fit around everything else. By the time I get to the end of load I need to be done so I pretty ruin all the work that happens before. When I first have a new load of dishes to put in the dishwasher- I am very well organized and place everything in what I think to be the most methodical and efficient way. However, when it gets down to the wire and I have just those last few pieces that don’t want to fit in with my organized manner, it becomes stuffing pandemonium. All of a sudden my neat arrangement looks like it has been tortured by Oscar the Grouch with cups and pans I forgot about on the stove-top being stuffed into every inch available. But instead of trying to re-organize and re-stack, I just turn my head in dismay and shut the dishwasher and start the cycle, hoping that they all come out perfectly clean! My loading style would definitely be orderly. I place all the plates in a row. I put all the glasses and bowls on top from sizes small to large. I make sure that all really baked on or greasy has a least been wiped down to not get the other dishes all mucked up. I am what you would call a perfectionist in all ways, but my dishes, thanks to Cascade, always comes out squeaky clean! My loading style is “LIFO”. I can’t help that I’m an accountant and load my dishwasher “Last In, First Out”. That way the most recently used dishes get put on the bottom of the stack in the cabinet to promote equal wear and tear on the dishes! My loading style is “Control Freak” because I won’t let anyone else load the dishwasher! Many other titles would be accurate, too: such as, “Re-Arranger” or I’m a little bit OC… I’m never satisfied with placement of the dishes. You’d think after the multiple times I’ve run the dishwasher, I’d have it down pat! anyway, this is a fabulous prize. Thanks for the giveaway! Simply Squeeze. I’m always trying to squeeze as many plates and cups into the dishwasher that I can as I hate having to wash dishes by hand. My loading style is the Jigsaw Puzzler! Instead of everything being neat and organized, I just keep loading them in strange formations of different shaped dishes, finding pieces that fit together just so. It takes some time and logic, but when finished, it’s a masterpiece of dishes all crammed tightly together. I would call mine clean and cleaner. I need a dishwasher. LG Random Throw Down, I live a little on the wild size no rhyme nor reason to where the plastics go and where the metal goes just clean fun. B-Full!? NO! NEVER! Two bowls, four spoons, three cups can ALL STILL FIT!!! Oh, it’s already been running ten minutes??? That’s OK!!! B: I mainly just rinse or soak (depending how long it has been left around!!!) in steaming hot water to rinse off as much troublesome spots as I possibly can. Next I load the dishwasher up top first, and then bottom or as the dishes come. I fit everything in like a puzzle! My style is “If it’s dishwasher safe, it’s going in!” I really wait until the dishwasher is filled, make sure that nothing is blocking any dish from getting clean and that it’s all organized in an orderly fashion. Very nice! We could certainly use a new one! Slow and Steady Wins the Race! – I load dishes over several days, then have a completely full dishwasher so that I don’t waste water when washing a load of dishes. I think ive found my next dishwasher! I have the same problems you had with wanting to put my pots & pans in but they wont fit! Even some of our glasses wont fit on the top shelf where they are suppose to go. Its very frustrating. My current dishwasher does a pretty good job but if you overload it you will be left with residue all over the dishes! Then I have to wash the dishes by hand! Very frustrating! This is good to know for the future. I feel like my current dishwasher doesn’t clean very good some of the time, which is disappointing. Having to thoroughly inspect each item for cleanliness is annoying. very nice dish washer..i wish i had one..thank you for sharing. i love the height adjustable rack!!! and it is beautiful to look at! This unit sounds wonderful. Mine sounds like a band in a parade marching so loud. And to enjoy a dishwasher that’s quite and not always hooking my tiny utensils on the tines for a workout to remove them, would be a welcome treat. I love the stainless steel look to the exterior verses just your everyday white color in dishwashers. Great review, thanks Heather.